﻿Orthodox Easter Day: Calendar, History, Tweets, Facts & Activities. Orthodox Easter commemorates Jesus' resurrection three days after his crucifixion and death. Following his death, he was removed from the cross and hastily buried in a tomb. On Sunday, it was discovered that Jesus' tomb was empty and angels informed onlookers that Jesus had risen. Throughout the next 40 days, Jesus appears to his apostles and disciples before finally ascending to heaven. Orthodox Easter is the highest and holiest of holidays in the Christian Orthodox faith. 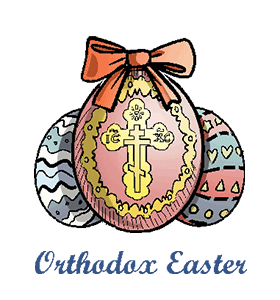 Orthodox Easter follows the Julian calendar and must take place after the Jewish Passover. For these reasons, Orthodox Easter is celebrated on the first Sunday, after the first full moon, following the vernal equinox and always after Jewish Passover. Eggs represent new life as well as Jesus' tomb. In some Orthodox churches eggs are dyed red to symbolize either the blood of Christ or the red cloak Roman soldiers put on Jesus as they tortured him. The final worship service of Pascha is usually held at noon on Sunday. Called the Agape Vespers, the service highlights St. Thomas' encounter with the risen Jesus. Thomas doubted that the resurrection was real until Jesus told him to touch his wounds. Thomas' story is usually read in a number of languages to emphasize the universal nature of Christ's life, death, and resurrection. Russian Orthodox believers often visit the cemetery on Easter, placing a dyed red egg on each loved one's grave. The eggs are dyed red because of a tradition that says Roman soldiers put on Jesus' red cloak after he was crucified. Consider paying homage to your deceased loved ones on Easter.